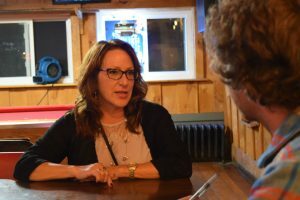 HEUVELTON, N.Y – Democrat Renee Cole, who won the County Treasurer’s race in St. Lawrence County, enjoyed a well-earned beer in Doug’s Tavern late yesterday on a tough night across the country for Democrats. Cole said it has been a long campaign and she’s glad its over. “If I hadn’t won, I would have been devastated. Tomorrow, I would have been unemployed,” said Cole. Cole has been the deputy county treasurer since May, 2015. She stepped in when the previous treasurer quit. Previously, she worked for the county’s social services department. Cole has been heavily campaigning for months. Cole said her campaign has been such a whirlwind that she’s hadn’t been paying attention to the presidential votes coming in. But she seemed surprised Trump polled so strongly. Cole said she is used to working with different people from different backgrounds and beliefs. Her husband is a Trump supporter. Their relationship is evidence that differences do not determine everything. In other races, Republican Elise Stefanik won the election for the 21st Congressional District. The incumbent Stefanik has reportedly won re-election for the district with 63 per cent of the vote. Democrat Mike Derrick garnered 28 per cent of the vote with Green Party candidate Matt Funiciello far behind. 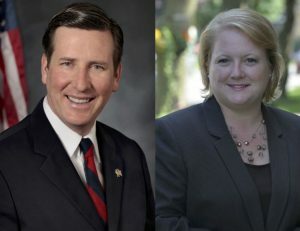 In the 116th Assembly District Race, Democratic candidate Addie Russell is reported to have defeated Republican John Byrne for the state assembly. Russell, who defeated Byrne by a margin of less than 100 votes in the election two years ago, has won by a larger margin this time. The New York State Board of Elections has listed that Russell has unofficially defeated Byrne by a margin of 46 per cent of the popular vote to 39 per cent.